PUS Airport is one of the four major international airports in the country, located near Busan. The Airport connects Busan to 42 cities in 12 countries for more than 5.7 million passengers a year, with approximately 780 direct scheduled flights a week. ICN Airport is the major gateway to Korea and has been acknowledged as the “Best Airport in the World” by the Airports Council International (ACI) for almost a decade, Global Traveler and Skytrax. The Airport connects Seoul to 176 cities in 60 countries, with more than 4,500 scheduled flights per week. GMP Airport, the former national gateway prior to the opening of the ICN, still serves the nation as the main hub for domestic and international air travel. 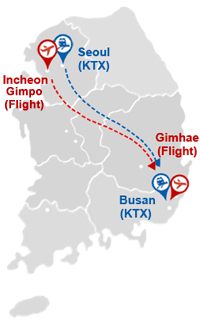 Domestic flights provided by 7 national carriers and international flights connecting Seoul to the major cities in Asia keep this Airport busy 24/7. The two major national carriers including Korean Air, a proud member of Sky Team and Asiana Airlines, a proud member of Star Alliance will be appointed as the official carriers for the IAUGA 2021 participants in order to provide the most competitive and flexible airfares possible.